A luxurious edition of the folio L’idea dell’architettura universale by Vincenzo Scamozzi was printed expensis auctoris in Venice in 1615. Although the book remained unfinished in the author’s intentions, it was the fruit of long labor: 824 pages subdivided into two volumes and supplemented by 84 illustrations, 45 of which are copperplate engravings. Born in Vicenza in 1548, Scamozzi was educated in architecture by his father. 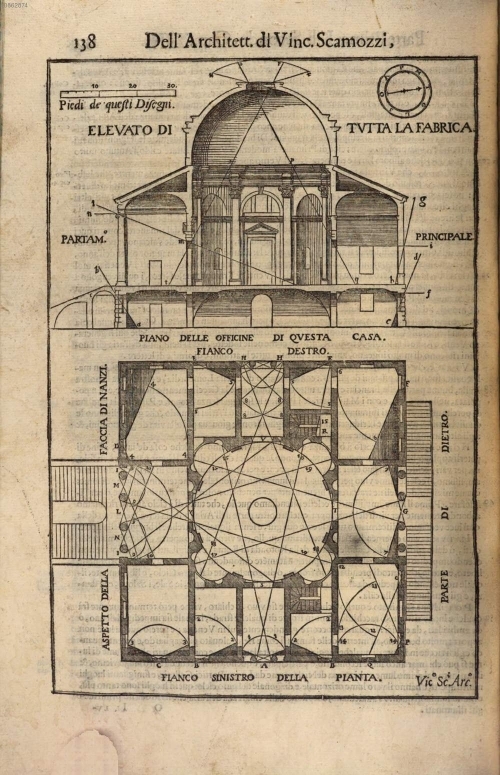 From his early years, Vincenzo manifested a certain interest in mathematics and “mechanics”, in this way attaining a very wide culture, going far beyond the limits of the disciplines which were traditionally linked to architecture, and drawing him closer to the cultural ferment provoked by Galileo’s presence in Padua. Scamozzi’s greatest ambition was to write a treatise which would go back over and surpass all preceding works, from Vitruvius to Palladio. He began writing in the first years of the 1590s, and worked on it for more than twenty-five years. At first, he considered dividing his analysis into twelve books, but with time the project was reduced to ten volumes and in 1615, at the end of the author’s life (he was to die the following year) only eight were published. As indicated in the title, Scamozzi intended to put forward a systematic reflection on architecture as a discipline. This gigantic effort materialized in what is considered to be the last treatise on architecture of the Renaissance, attempting to assemble all the historical and technical sources relative to the discipline. Resorting to illustrious examples from the past, which he uses to give more weight to his own arguments (in agreement with the tradition seeing the major points of reference in Plato, Aristotle and Vitruvius), Scamozzi defines architecture as a speculative science. The architect’s role is essential: he is the one who “invents and draws” the building, disposes and distributes its constituent elements with “correspondence and order”. Therefore, the first concepts that the architect must assimilate, on which he will base his knowledge, are related to geometry and mathematics (vol. 1, p. 29). And, in fact, Scamozzi lingers on the bases of geometric construction in the first book. 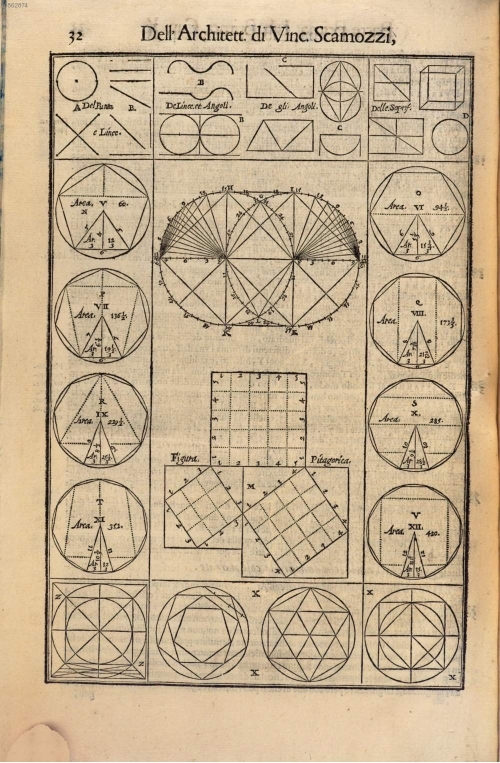 It is only after long preliminary considerations that the first plate illustrating the construction of geometric forms appears: the way to calculate complex surfaces and squaring the circle. 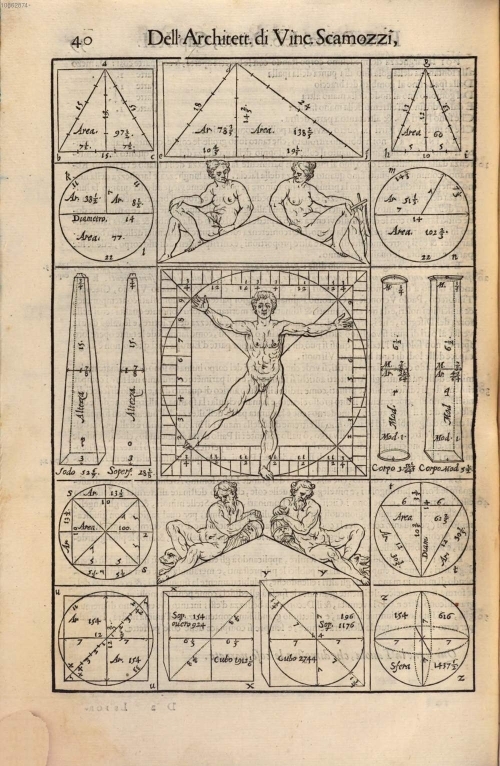 An important chapter follows the theoretical explanation of the bases of geometry, “Dell’eccellenza delle forme naturali, e proportioni del corpo umano…” (vol. 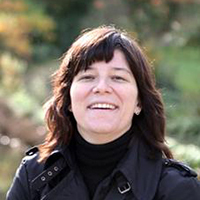 1, pp. 37-43). Taking up the pair what is theory and what is experienced through the senses, Scamozzi does his utmost to deal with the materialization of forms in nature. In this framework, the height of perfection is attained by the human body, considered - in line with the example traced by many of his predecessors - under many aspects the supreme marvel (vol. 1, p. 38). The architect must create his own inventioni and make his own drawings in such a way as to imitate nature, and more particularly the human body, a miracle of proportions. The attention for the natural world is especially evident in the second book. Here - after discussing the characteristics and qualities of sites, waters and winds - Scamozzi presents an extremely interesting plate in which the section and plan of the Villa Bardellini in Monfumo (c.1594, destroyed), are crossed by numerous lines, diagonals and curves. These correspond to Scamozzi’s theoretical classification of light and its application to design practice. It is particularly interesting to notice how the architect uses shading in this plate to illustrate the effect produced by natural light in the interior of the building. In the section he indicates six different species of light, while the passage of light through the rooms is shown on the plan. On the occasion of the exhibition Nella mente di Vincenzo Scamozzi: un intellettuale architetto al tramonto del Rinascimento, held at Palladio Museum, Vicenza (Italy), 25 May–20 November 2016, and jointly organized by the Centro Internazionale di Studi di Architettura Andrea Palladio and the Canadian Centre for Architecture in Montreal, in collaboration with the Stiftung Bibliothek Werner Oechslin, two videos were produced. One of the two - presented here below - explains in a very effective way Scamozzi’s three-dimensional reasoning underpinning this plate. Scamozzi evidently pays detailed attention to architectural lightning, as many other illustrations in his Idea can demonstrate. In these plates, we cannot just notice his interest in the good qualities of the drawing and the use of shades to represent different planes or surfaces on the bi-dimensional space of the page, but a genuine attention to the three-dimensional effect that the light can produce on built architecture, and consequently on the quality of the building itself for its inhabitants. Charles Davis, “Architecture and Light: Vincenzo Scamozzi’s Statuary Installation in the Chiesetta of Palazzo Ducale in Venice,” Annali di architettura 14 (2002), 171–93. 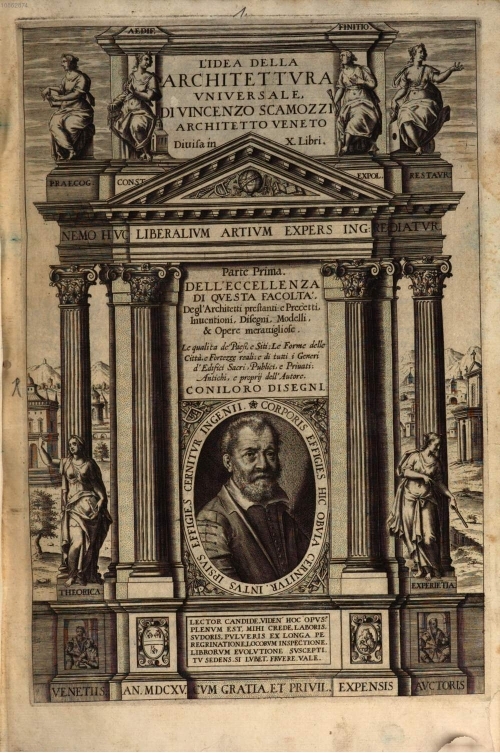 Charles Davis, “Vincenzo Scamozzi architetto della luce,” in Franco Barbieri and Guido Beltramini, eds., Vincenzo Scamozzi, 1548–1616 (Venice: Marsilio Editori, 2003), 33–45. Laura Moretti, entry on L’idea della architettura universale for the database Architectura, hosted by the Centre d’Études Supérieures de la Renaissance, Tours.